Essential fatty acids (EFAs) are exactly what they sound like—they’re something you must have. The only way to get EFAs is through your diet. Your body needs EFAs to be healthy, but it can’t synthesize these beneficial nutrients on its own. You have to consume certain foods to get enough EFAs into your diet, and that likely means adding seafood to your meals. There are still many of you out there who prefer to cook a steak or a chicken breast, but here’s some solid proof that you need to get some fish broiling in the oven, too. German researchers have just reconfirmed that seafood, such as fish and shellfish, contains many nutrients beneficial for the human diet, like n-3 polyunsaturated long chain fatty acids (PUFAs). In particular, the researchers were talking about eicosapentaenoic acid (EPA) and docosahexaenoic acid (DHA). EPA and DHA combine to play a huge role in the health of your brain. These two fatty acids help preserve your thinking processes and memory, acting as a shield against Alzheimer’s and dementia. Not only that, but seafood also contains essential elements, such as selenium and iodine. When you’re deficient in selenium, you may be opening the door to a number of health conditions like cancer, HIV, tuberculosis, and diabetes. But before you run out and buy a selenium supplement, you should know that you only need a trace amount of the mineral—too much is toxic to your body. 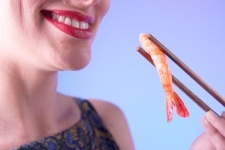 It’s better to get selenium in its natural form by eating seafood. As for iodine, it helps to keep your thyroid running smoothly. Your thyroid is a regulator of your metabolic rate. Iodine is needed for the production of key thyroid hormones. Now, what else can eating seafood once or twice a week do for you? It can give you a healthy dose of potassium, vitamins D, A, E, and B12, as well as taurine, among other nutrients. Seafood is high in protein that’s highly digestible due to its low connective tissue content (unlike red meat). Fish is low in cholesterol content. The only downside to eating fish is that its habitat has become polluted. This means there is the possibility of health risks associated with organic pollutants, toxins, parasites, and heavy metals. However, many studies have proven that the benefits of fish intake exceed the potential risks, even for vulnerable consumers. Oehlenschlager, J., “Seafood: nutritional benefits and risk aspects,” Int J Vitam Nutr Res. June 2012; 82(3): 168–76; 10.1024/0300-9831/a000108.